When you live in a city, you get used to being surrounded by people at all times–even when you get home to your apartment. With populations increasing and cities becoming more dense, large numbers of people are forced to live in smaller spaces. And when you have neighbors on all sides in a building that’s likely surrounded by automobile traffic and construction, air quality can be an issue. So if you’ve ever felt the air in your apartment was a little “stuffy”, you’re probably not imagining it. Below we have some of the common causes of poor indoor air quality in city living spaces, and some tips on how to resolve them. You probably don’t want to imagine all the other people who have previously lived in your apartment, but sometimes it’s hard to ignore them. Smokers, pet owners, and slobs often leave behind a lingering scent. Mold, dust, and other irritants can easily be left behind in carpets, woodwork, and bathrooms. Depending on the size of your city, you could have anywhere from dozens of neighbors in the same building to hundreds of people in the same high-rise. Secondhand smoke can easily get into your apartment if any of your nearby neighbors are smokers, or if your apartment is next to a shared patio frequented by smokers. Cooking odors and fumes can leak into hallways or pass between open windows, and in addition to being annoying can irritate allergies and asthma symptoms. The types of chemicals present in your building’s construction largely depend on when it was built. But even in the newest constructions there can be harmful chemicals in the fire retardants used throughout the building, and even in the cleaning supplies that were used to clean your apartment after the previous tenant. Chances are if you’re in a mid-size or larger city, there are construction cranes dotting the skyline. With any new construction, dust and debris can get kicked up into the air around your apartment. Not all the blame for poor indoor air quality lies elsewhere. It’s important for you to properly ventilate your apartment when cooking and cleaning. Keep the exhaust fan on when cooking and open a window if you’re doing any cleaning with chemicals. These simple steps will help prevent the buildup of volatile organic compounds (VOCs), which are harmful to respiratory and overall health. This is especially true in apartments, where the small rooms can more easily trap pollutants. You can offset this by opening windows when weather permits, or trying to use a fan to circulate the air. This will help clear out or at least dilute the levels of irritants in the air. Concerned about secondhand smoke or residue from building materials? Get a purifier that filters particulates and chemicals from the air. 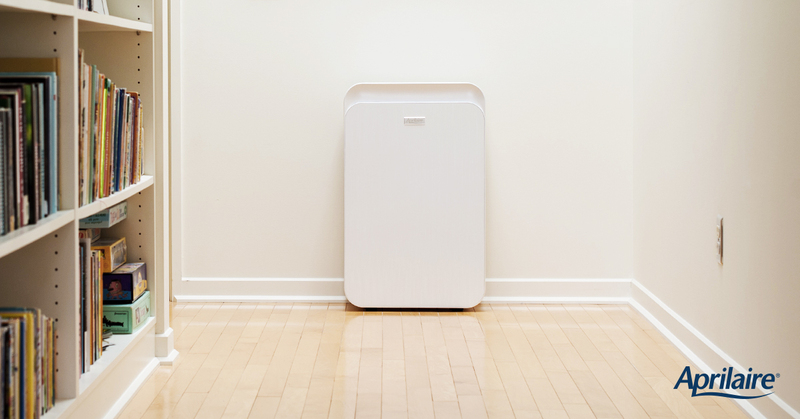 This Aprilaire Allergy Room Purifier is perfect for anyone with allergies who’s concerned with the air in their apartment. It handles common things like dust and mold spores and also filters out VOCs and other gaseous allergy triggers. These are simple, in-home kits that take a sample of the surrounding air. Then you send them back to the company, where their lab analyzes the results. Once you know what pollutants are lingering in your environment, you’ll be able to take the necessary steps to remove them. And remember, sometimes that means alerting your landlord or property manager to make sure your building is up to code. Previous Previous post: Do you live in an allergy “capital?” Here’s how to cope!